This month’s ebay treat. I’ve named this chap Billy. 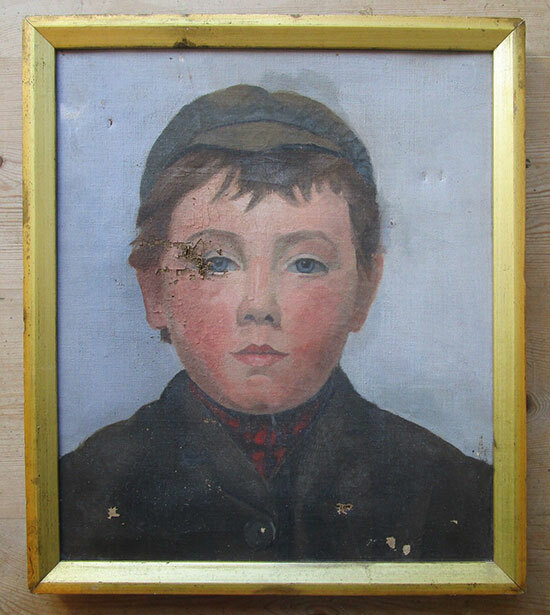 Bought on ebay, this unusual naive style portrait of a boy is in a bit of a state. There is damage and paint loss around the eye, but I think this adds to the character of the painting. I mean look at that face…the ruddy cheeks and that petulant purse of the lips tells me he’s a bit of a bruiser who’s prone to getting into fights and playing truant. 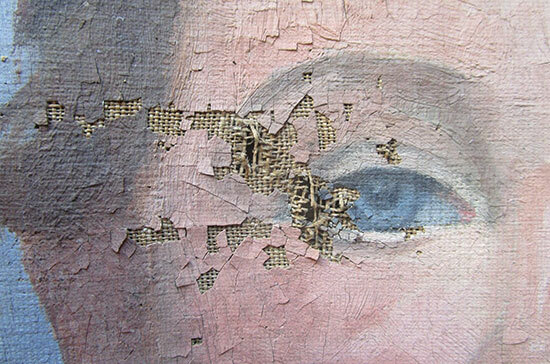 It’s as though the painting itself has got into a scrap and received a left hook to the right eye! Billy the bruiser. This one is a conundrum. By the look of his expression and stiff, impatient posture, he was a reluctant portrait sitter. I can’t imagine it was commissioned, and if it was why? He’s not the prettiest kid in the world! So why was it painted? Chubby, grumpy looking schoolboys are not usually a subject matter favoured by artists. It’s quite crudely painted. Not much time was spent perfecting it, but it oozes character and attitude. I’m getting hints of Lowri and Augustus John. Is that a tartan scarf? Scottish maybe? It screams working class. 50’s? Maybe 60’s? A social comment? Or just the artist painting the first person he saw that day when he just had to get something down on canvas? But would they lose their enigmatic resonance? I suppose it would be a bit like knowing what your cat is thinking. Some things are best left to the imagination.